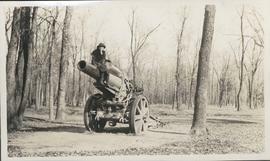 Photograph shows unidentified woman sitting on a large artillery gun, taken during the fall season. One of three photos mounted on page with caption "Scenes - Kildonan Park." Date of photograph is probable, [1923?]. Photograph shows unidentified woman posing next to large tree, taken during the fall season. One of three photos mounted on page with caption "Scenes - Kildonan Park." Date of photograph is probable, [1923? ].